You’ve gotta love a man that buys himself a 4 quart slow cooker as a birthday treat! He was in the mood for chili but didn’t want to use the 8 quart bad boy because we’d have to make enough for a small army. So once the new addition was purchased, unpackaged and washed, it was time to seek out the perfect recipe. We decided to go with Cook’s Country’s recipe. They offered tips on how to keep the meat moist, during the long cooking period. I also appreciated the toasting of the various spices, of which there were plenty. Lastly, it included bacon. BACON. Much to my dismay, we actually skipped the bacon to make this somewhat healthy. So first up? Toasting the spices in a Dutch oven. As soon as you start smelling the spices, they’re done, (just a few minutes). 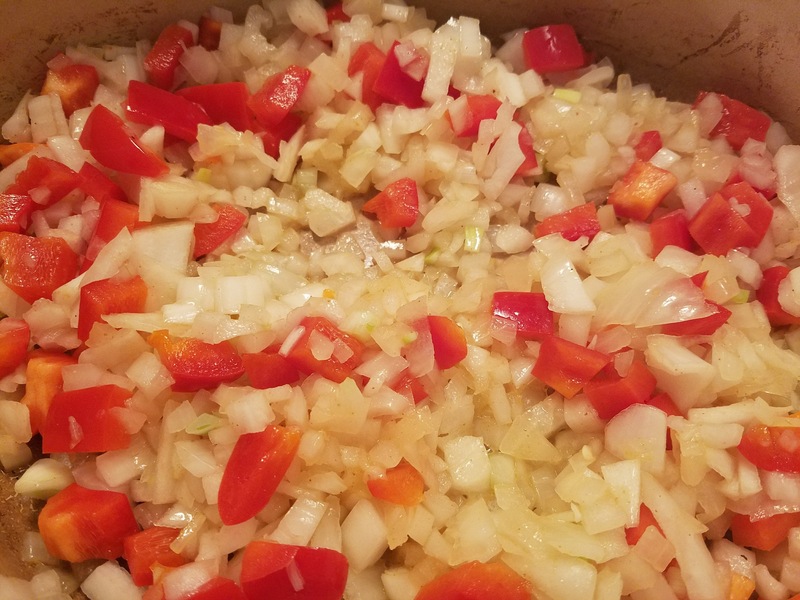 Next is the softening of the red bell pepper and the onion. I prefer to season as I go so each step gets a bit of salt. Add the beef and slightly brown It. You still want to see some pink!! While the meat is draining in a colander, the puréed and diced tomatoes get added to the pot, along with the toasted spices. Be sure to keep tasting and season with salt and pepper! The drained meat / onions / bell pepper mixture gets added back to the pot for a quick simmer. We had leftovers from an incredible NY sirloin that we opted to throw in. At this point you’re wondering, ‘where the hell are the beans???’. Well because they’re the star of the show, they don’t join the party until the last hour, (if cooking on low), or the last 30 minutes, (if cooking on high). Although the recipe calls for the beans to be drained, we used a Mexican canned bean that came in a yummy sauce. Since we added the extra beef, we needed more liquid so we didn’t drain that lovely sauce. The lid went on and that was IT! While it simmered on high for a few hours, I chopped up some green onions and shredded the cheese. Being the heat freaks we are, I added 1/4 cup of hot sauce and tripled the pepper flakes. Even then, it wasn’t too spicy. Courtesy of Cook’s Illustrated June / July 2006. 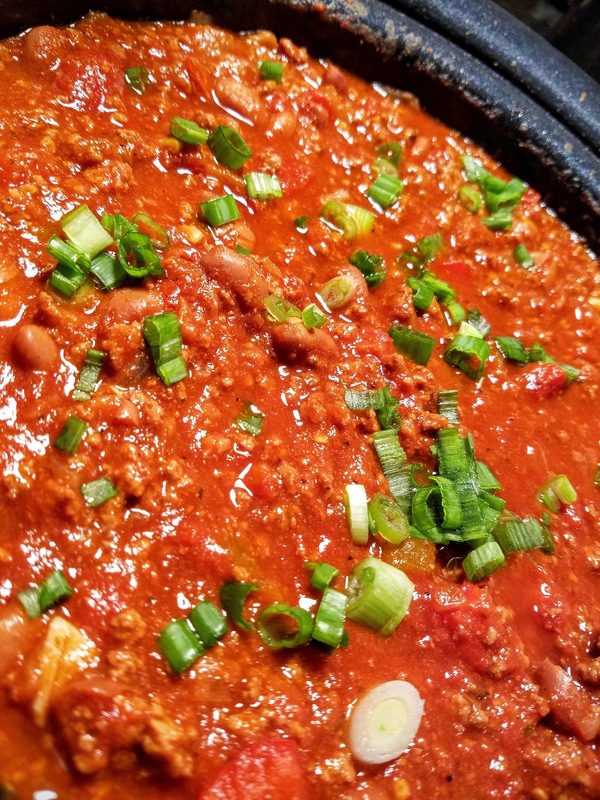 To keep our Slow-Cooker Weeknight Chili recipe from turning out too greasy, we used reasonably lean 85 percent lean ground chuck and supplemented it with smoky bacon. Browning the meat was important, but it was just as important to not overbrown it. Leaving the meat a little pink ensured that it stayed tender during the long simmer in the slow cooker. Also, to keep the recipe’s beans from turning mushy and breaking apart, we added them during the last hour of cooking. Serve this all-American classic with sour cream and cheese to cool the burn. 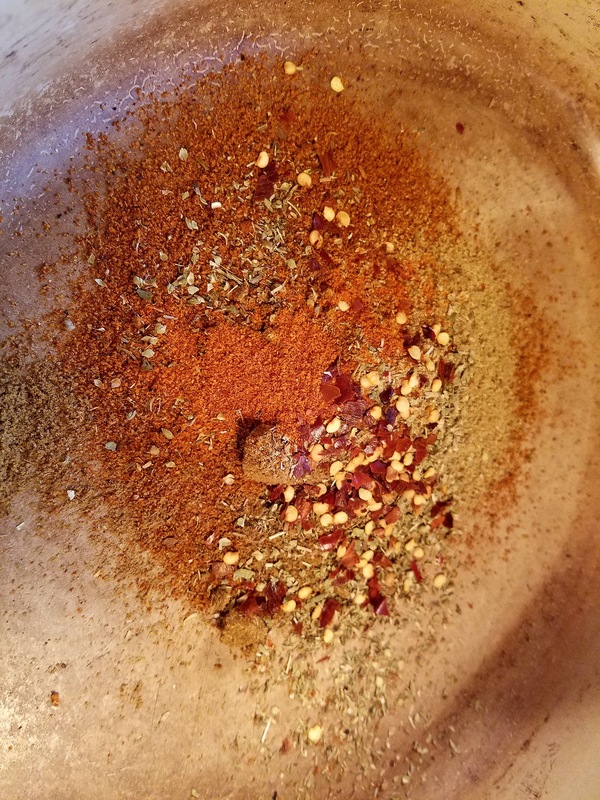 For less heat, reduce the cayenne pepper to 1/4 teaspoon or omit it altogether. 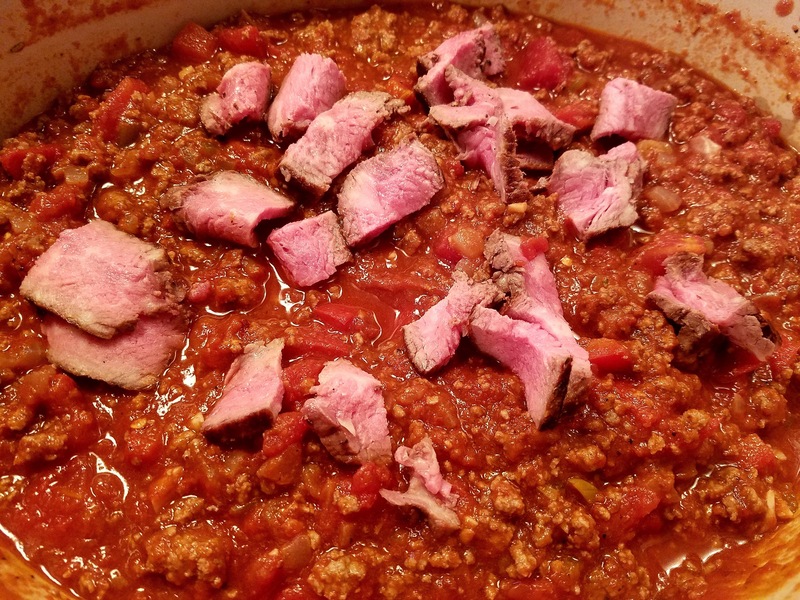 The ground beef will become dry if the chili is cooked for more than 8 hours. 1. Toast chili powder, cumin, coriander, oregano, cayenne, and pepper flakes in large Dutch oven over medium heat until fragrant, about 2 minutes. Transfer toasted spices to bowl. Add bacon to Dutch oven and cook over medium heat until crisp, 8 to 10 minutes. Transfer bacon to plate lined with paper towels and pour off all but 1 teaspoon fat from pot. Return pot to medium heat, add onions and bell pepper, and cook until softened, about 5 minutes. Stir in garlic and cook until fragrant, about 30 seconds. 2. Add beef, 2 teaspoons salt, and 1 teaspoon pepper. Increase heat to medium-high and cook, using wooden spoon to break up beef into 1/2-inch pieces, until just slightly pink, about 5 minutes. Drain beef and vegetables in colander. 3. 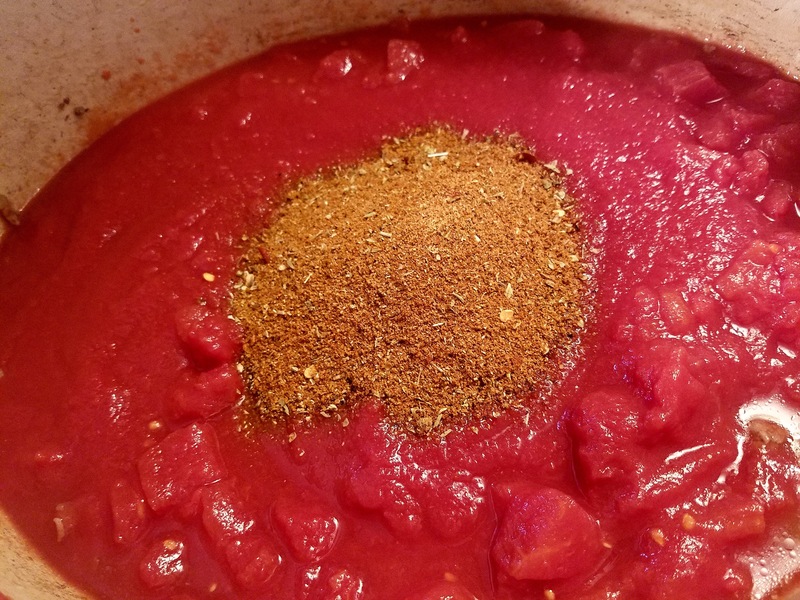 Add tomato puree, diced tomatoes, and toasted spices to empty pot and bring to simmer over medium-high heat, scraping up any browned bits from bottom of pot. Return drained beef and vegetable mixture and bacon to pot, stir to combine, and bring to simmer. Transfer contents to slow-cooker insert. 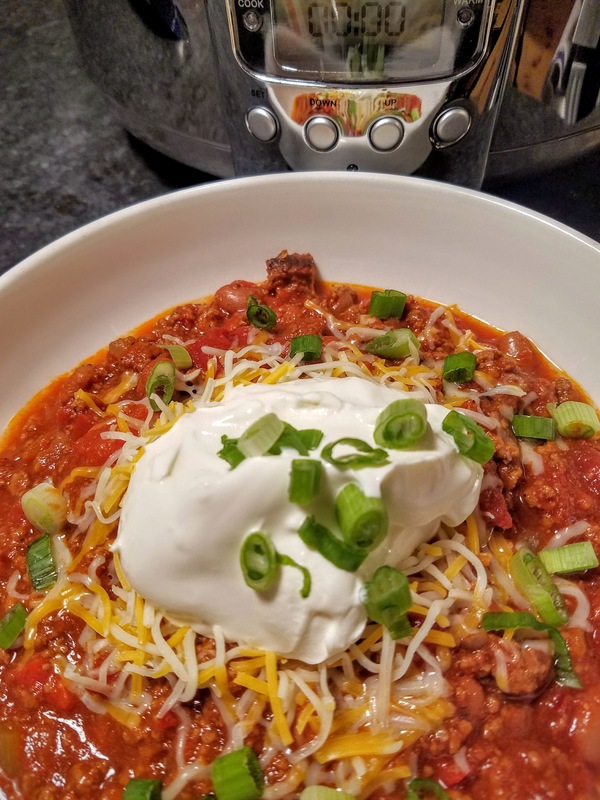 Make Ahead: If you’d prefer to just dump the chili ingredients into the slow cooker before running off to work, you can do all the work the night before. Follow the recipe through step 3, but continue to simmer the assembled chili for 10 minutes. Transfer the chili to an airtight container and refrigerate overnight. 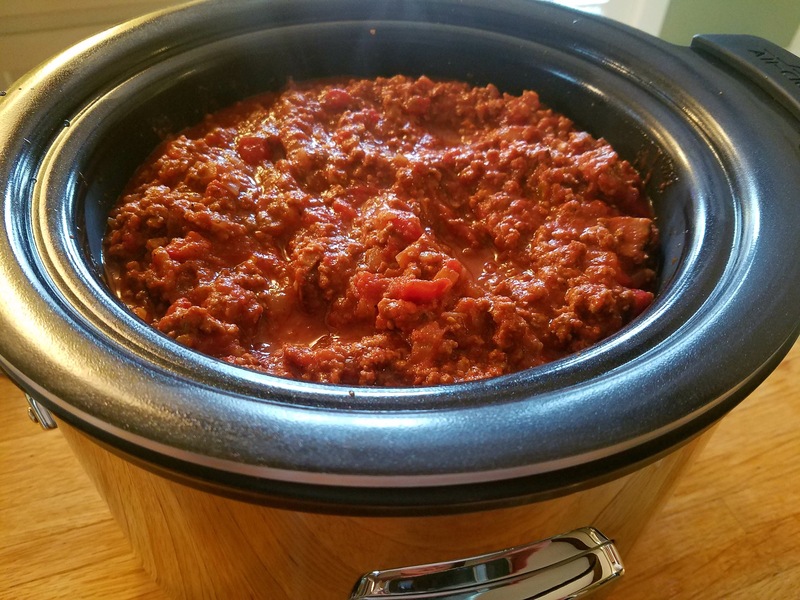 In the morning, simmer the chili in a Dutch oven for 10 minutes, then transfer it to your slow cooker and proceed with step 4.